Although Korean investors are the most active in Vietnam in term of foreign direct investments (FDI), they are less active in term of indirect investments via merger & acquisition (M&A). Korean companies ranked top the second, after Japan, in FDI into Vietnam in 2018 with total registered amount of US$7.2 billion, accounting for 20.3% of total foreign direct investments in Vietnam, according to General Statistics Office of Vietnam. However, in term of M&A deals, South Korean investors ranked the third with 5 deals, valuing at US$251mn for the first half of 2018. Noticeable deals include the two mega transactions by the Korean financial players i.e. Shinhan Card Co., Ltd ’s purchase of 100% equity stake in Prudential Vietnam Finance Company for US$151mn and Lotte Shopping Co., Ltd ‘s purchase of 100% equity stake in Techcom Finance Co., Ltd for approximately US$74.67mn, according to the data by StoxPlus. 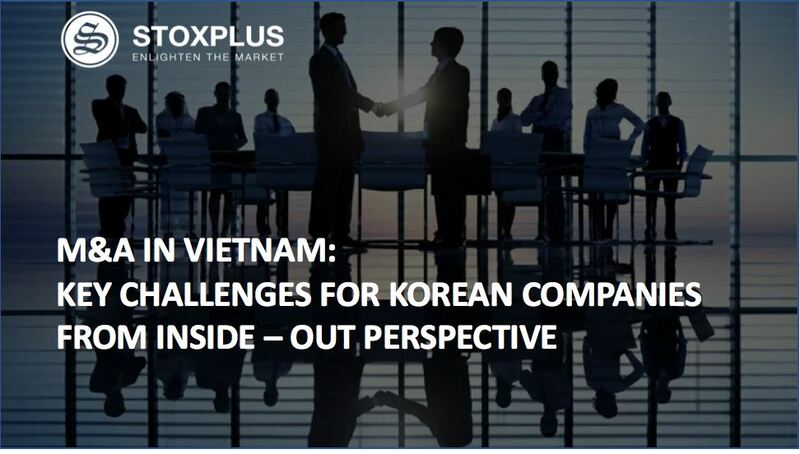 From a Vietnamese perspective Mr. Nguyen Quang Thuan, CEO of StoxPlus shared his insights about the most critical challenges that Korean investors are facing during their researching and executing the M&A transactions in Vietnam. Firstly, unlike Japanese, Korean investors normally put a strong condition for purchasing a controlling stake for management rights in a Vietnamese target company. This sometimes makes them disadvantageous in negotiation with Vietnamese entrepreneurs. In fact, the requirement on the majority and controlling stake is difficult to accept for the owner of many Vietnamese enterprises, especially those who do not have a clear succession plan or a strategy to sell the entire business. In many transactions that I supported Korean investors, Vietnamese owners are very shy or even refuse for the first meeting request despite the fact that they might open the possibility of selling or transferring controlling shares.The root cause is that most Vietnamese enterprises have not clearly defined their overall strategy, making it difficult for Korean investors to approach and present their cooperation plans before discussing the specific investment percentage. In addition, many Vietnamese companies from large to small, their business model is very mixed while the ownership structure and corporate reporting system is not well established. For example, a textile company can have a real estate development project which is mixed up in financial reporting with their textile business. In another example, a very large Vietnamese flexible packaging business based in Hanoi who have 5 different packaging factories with different shareholders and this make themselves less attractive to the Korean in term of whole acquisition of the packaging business. The approach of Japanese investors is somewhat more flexible. In many projects, although Japanese investors also have this requirement, they are willing to make it a secondary goal and Japanese investors will prefer a small strategic/small equity investment and negotiate with condition/ right to increase shares to controlling stake in the future. [can you please give example or name 1 or 2 cases where the Japanese did that? I understand that it is reasonable for Korean investors not to prefer minority stake as it might be very challenging for the Korean investors in participating the management and new development direction according to its intentions. However, in the business environment and the scale of Vietnamese enterprises, I believe that joining the board of directors would be a flexible approach and open the opportunity for Korean investors to create the partnership and trust with Vietnamese management team in developing businesses at a larger scale. Once the company well performs, Korean investor might exercise their options so that they can increase their shares to the majority or controlling level. Secondly, screening for a sizable deal in Vietnam is not an easy task for any foreign investors, particularly for Korean investors with majority stake requirement. According to StoxPlus’s corporate database, there are only 40,000 out of approximately 1mn registered companies that has annual net sales of over VND100bn (or US$4.3mn). Of which, approx. 3,000 are listed on exchange (HOSE, HNX, UPCOM). It is very common to receive requirements from Korean investors who set the annual sales minimum of US$20m for possible M&A in Vietnam. This is hard for Korean investors actually. For example, Vietnam is home to over 3,000 logistics service providers. Of which, 70% are small, family-run businesses, providing low-added value asset-based services (1PL) or contract logistics providers (2PL). Except for some big names (VINAFCO, Gemadept, Bac Ky, INDO-TRANS), local firms are small and medium-sized with the annual net sales of less than US$10mn, which is not sizable in the view of foreign investors. In fact, only 200 over 3,000 firms have annual net sales of US$10mn or more. In another example, Vietnam plastic packaging is very fragmented with over 1,500 players. However, the market is dominated by top 20 players. According to StoxPlus’s database, there are only 150 companies with annual net sales of over US$5mn. Of which, the majority are FDI companies or already acquired by foreign players, making it a challenge for Korean investors to penetrate in this market via M&A. With a small scale, most businesses do not have a standard corporate governance system. Currently, corporate governance standards in Vietnam only apply to listed companies but not for unlisted companies. Given a limited choice with sizable deal size, poor corporate government makes it more difficult for foreign investors to choose a Vietnamese enterprise suitable for M&A. Thirdly, dual accounting common which is defined when a company has one more accounting system or set of financial reports in addition to the report filing with tax authorities and for their reporting to shareholders. Dual accounting issue can be also understood when a company has financial results filing to Tax Authority is vastly different from its financial reports prepared under the local accounting standards. This practice in any emerging markets. However, the issue is more prominent in Vietnam although it is prohibited by Vietnamese Accounting Law. In our experience, this created a significant inherent risk in term of contingent tax liabilities to the investors who take over the company in post-acquisition. In fact, from our own study, the issue is more common at retail businesses in Vietnam where their retail customers are mostly “walk-in” buyers and they normally don’t ask for the official tax invoice and this make stores easier in manipulating i.e. understating the sales for tax filing purposes. It is better for Korean investors to have some preliminary due diligence before engaging professional accounting firms to save the costs or to proceed the deal but with a break-up during the course of transaction. Mr. Thuan Nguyen is co-founder and CEO of StoxPlus, Vietnam’s leading information business and research firm. He leads various cross-border M&A deals for Japanese and Korean into Vietnam. Before founding StoxPlus, he was the manager at Deal Services at PwC Vietnam and Australia and investment manager at Vietnam Holding Asset Management with US$150M AUM.